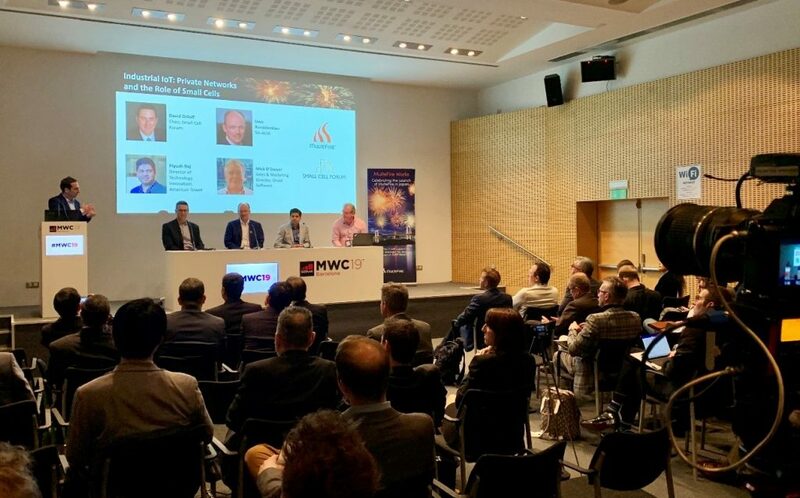 In keeping with tradition, I’m writing a blog on the latest MulteFire Open Day – which took place during MWC19 – to provide you with insight into some of the discussions taking place in the industry around MulteFire. While I was unable to attend this year’s event in person, I was able to watch the panel discussion that has been posted by RCR Wireless News here. For the first time, we partnered with the Small Cell Forum on the panel in order to focus the discussion around the role of small cells as they relate to Private Networks for Industrial IoT and Enterprise. Moderated by James Blackman, editor of Enterprise IoT Insights, the panelists included David Orloff, Small Cell Forum Chair representing AT&T, Uwe Rueddenklau, 5G-ACIA Co-Chair and director of program management for Infineon, Piyush Raj, director of Technology with American Tower, and Mick O’Dwyer, sales and marketing director for Druid Software. Lack of spectrum is driving new technology. One of the biggest challenges for connectivity is the lack of available spectrum. Both MulteFire and CBRS are defining new technology that leverage unlicensed and shared spectrum for standalone private network deployments. Control your destiny. Large enterprises and campus environments such as hospitals with mission-critical IoT and voice applications want to be able to control their own destiny. Private networks allow Enterprise owners to control their capacity and coverage, and deploy a network that meets their specific requirements. Reliability and availability are critical. The telecom industry has long been known for its stringent requirements around five nines. For new applications such as autonomous vehicles, augmented reality, or factory robots, wireless connectivity will need to be as good as wired connectivity. It will need to meet function with 99.999% or even 99.9999% availability and reliability. Small cells enable ease of deployment. How do you remove the barriers to enterprise deployment of MulteFire technology? You make it as easy and as fast to deploy as possible. MulteFire technology – which is deployed via small cells – meets these requirements. Deployed as a private LTE network, it combines simplified installation with a cost model that the customer can understand. The future is 5G. 5G will bring in new high bandwidth, low latency applications and Enterprises and Industrial IoT will consume all of it. The MulteFire Alliance has a path to 5G and is committed to active support of 3GPP 5G NR Standalone standardization efforts for Release 16. I encourage you to check out the full panel discussion here. Our next two Open Days are just around the corner! Join us for MulteFire Open Day – Krakow on March 26, hosted by Comarch, and MulteFire Open Day – Hannover Messe on April 2. Follow the links to register. I look forward to meeting you at a future event.